Galderma announced in December 2016 that the FDA had approved its cosmetic hyaluronic acid fillers Restylane Refyne and Restylane Defyne for treatment of laugh lines, or nasolabial folds. MilfordMD Cosmetic Dermatology Surgery & Laser Center, in Milford, Penn., is among the first practices nationally offering the newly approved fillers. 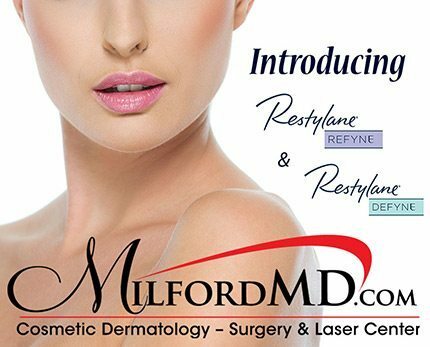 MilfordMD Cosmetic Dermatology Surgery & Laser Center is among the first practices to offer newly FDA-approved Restylane Refyne & Restylane Defyne for the treatment of laugh lines (nasolabial folds). Called next-generation flexible hyaluronic acid dermal fillers, Refyne and Defyne are manufactured with XpresHAn Technology, according to Galderma, the company that makes Restylane filler products. “The laugh lines are a dynamic area of the face, with a lot of constant movement. These fillers are flexible to accommodate that movement, while offering a lasting effect. Refyne and Defyne have been shown in studies to last up to a year,” Dr. Buckley says. The XpresHAn Technology manufacturing process results in a smooth injectable gel that offers natural looking results. The advanced technology customizes the degree of hyaluronic acid (HA) crosslinking in each filler, which allows providers the flexibility to meet different patient’s cosmetic needs. Galderma released news on two phase 3 studies on Refyne and Defyne, which looked at the individual filler’s safety and effectiveness. One study involved 171 patients; the other 162 patients. Both studies found that the majority of patients who received filler treatment had noticeable improvement in the severity of their wrinkles and the improvement lasted up to 12 months. Researchers used a five-point rating to determine the fillers’ effects on wrinkle severity, with a grade of one being the absence of wrinkles and grade five being extremely deep and long wrinkles. According to the studies, 79 percent of Restylane Refyne patients and 77 percent of Restylane Defyne subjects had at least a one-grade improvement on the scale after six weeks. Much like the post-treatment side effects reported with other Restylane fillers, the most common post-injection findings were mild to moderate redness, swelling, bruising, lump or bump formation and pain or tenderness at the injection site that lasted one to two weeks.